This year I tried to make sure our Christmas season didn't feel so hectic and full. We let go of a few traditions that felt to much and revised a few to make them feel less stressful. The traditional gingerbread kit still took place! With a bit too much of eating of the candy and licking of the frosting. Overall, it was a success. And we make cookies! Funny enough, this was on a totally different day then the gingerbread house making yet it appears my children are wearing the same clothes. For the 2nd year in a row, Cousin Arli, joined us for cookie making. Though the whole thing was fun. The best part of the activity was that every single cookie Arli made had eyes on them! And we we feed the reindeer oatmeal Christmas Eve night. As well as, leave Santa cookies. Christmas morning our early risers get to open stockings first thing. Adalyn's was full of Shopkin items. Shane's was full of Star Wars. Next comes, Santa gifts! Those come wrapped in red. So far, what they've requested has been received. We'll see when that trend ends. Shane got his Star Wars Battlefront game for our so old PlayStation 2. Santa had to find this item on Ebay. Adalyn got her Mani and Pedi gift card! The kids get to purchase each other a gift (one of my favorite traditions!). Adalyn got Shane this little stuffed "Dodger". The kids also get to purchase a gift for each of us. Adalyn got Kenny a running hat and Shane got him running gloves. Checking out the calendar Papa gets every year. Christmas season is one of my favorite times of year. Finding the balance between soaking it in and enjoying it versus drowning in it takes a bit of practice. We are 7 months into the school year and having a Kindergartner in school all day still feels exciting for her and I.
Oh, how I was SOOOO upset that she wasn't going to be able to do half day Kindergarten this year. I was mad that the option had been taken away one year ahead of when it was suppose to arrive. How I thought for sure we were going to role right through the new mandatory full day Kindergarten roll out. But in the blink of an eye, half day was gone and full day it was. I dug my heals in. I walked through every possible option and solution, but none were the right fit. Keeping her at her preschool in the 5s class wouldn't give her enough foundation to head into 1st grade. Sending her to a private kindergarten would be a cost we weren't prepared for and still meant two changes in schools in two years. Pulling her out of a full day class at our elementary school, making her half day, was a Horrible option. Though the school district considered that an "option" if I wanted her in half day. In my heart I knew she could do it. I knew that she would eat it up. Though my heart knew she could do it, my brain didn't want to make her do it. I see half day as such a perfect baby step into the long life of education she would have ahead of her. That I had the ability to give her that slow roll out into school even if she would be "just fine". My brain lost out and my heart set her free to her first full day of kindergarten on Friday, September 9th. Shane started school on Tuesday the 6th. The kinders had a late start to the school year. That Friday, Kenny and I both took the kids to school. We lined her up in the line outside of the building. We got their early so she could be the first one in line. She clung to me. As the commotion of the morning got under way, friends arrived and said hi, she just clung to me. The bell rung and she clung harder. Her teacher, Ms. Allan, came out to get the kids. Parents have always been asked to stay out and not come into the first day of class. Which I'm totally okay with. It just makes the separation that much harder. I kissed her good-bye and she walked into school with tears in her eyes. BUT WAIT! There were parents filing into the school!!?? I was so confused! They aren't suppose to be going in! Kenny and I held back. I panicked. I didn't want her to be in class with parents all around and wonder why we weren't in there! I had told her parents weren't allowed in, which was what we had been told. I decide to go in and check on her. We found her hanging quietly sitting at her table. She was so happy to see us and show us where her cubby was. Ms. Allen was settling the kids in and working on getting the parents out. We kissed and hugged her good-bye again. She waved us off with just a tear or two. I couldn't wait to pick her up! I was so excited to see her come out of school that day. All smiles. And hangry! Yes, her biggest issue with school is not eating enough. She arrives to me hungry and angry most days. It's so hard for her to focus on eating at lunch time. There's just to much going on. In her words there is not enough time. Truly, there just isn't enough time to eat and talk at the same time. She is slowly getting better at consuming more food at lunch time and either talking less or figuring out how to talk and eat at the same time. She is also allowed to eat snack before and after lunch. Though she struggles to get that afternoon snack in. Just to much learning going on. So we battle hangry after school. Which means I come prepared with snacks and a LOT of patience. I thought besides food we'd really see her struggle with being tried at the end of the day. I've been amazed that I don't she isn't any different in this area any more then Shane is even as a 3rd grader. Monday they are energized and ready for the week. Come Thursday and Friday, they are in much need of a weekend full of down time. Trust me, they aren't even over-scheduled kids. I can't even imagine how they would be if I was whisking them off to this or that every day after school!? Generally, we come home and eat food, do homework and play. For the first month, she had a really hard time at drop off at school. I would wait in line with her until Ms. Allen came to get the class. While she cried and clung to me, refusing to play or talk to her friends. Shane started to regress and was making drop off even harder because he would want me to wait with him in his class line, too. I still haven't figured out how to make myself be in two places at once. After a few weeks of crying and fighting over who I said good-by to first or who's line I waited in. I said no more. Car drop off it is from now on. (Mama doesn't really enjoy hanging outside the school in the pouring rain for 10 minutes either.) Now there are no more tears. Everyone kisses me good-bye, hops out of the car and has a lovely day. They also now happily play on the playground instead of huddled around me like it's the end of the world. Most of the time the best practice is to rip the band-aid off fast! During the first month I also got an insane number of calls from the wonderful front office ladies. Adalyn managed to hurt herself daily at recess one way or another. If you bump, hit, or do anything that involves your head, you get a ticket to the nurses office, a concussion wrist band and a phone call home. I no joke, got 3-5 calls for multiple weeks in a row. I don't think she was purposely seeking attention, but she knew that if you got "hurt" and told the recess lady, she would get a trip to the office and I think that felt comforting to her. And if she wasn't in the office, then she was taking a friend to the office. After many talks about what warranted telling the recess lady this trend slowly faded and the calls from the front office stop. Socially she is a butterfly. I love seeing her run around at school on the playground. Playing games with boys and girls alike. The flip side of this is she is super dramatic. Most days she has some complaint about someone did this or said that to her. I don't think this will change any time soon. She's a bossy leader as well. We work on her "leadership" skills during play-dates. Some day this trait will bring her success. For know it's tiring. I'll be using my listening ears and empathy for a long time to come with this girlie! Academically she is soaking up every sound, letter, art, music, pe and math lesson that comes her way. This week she was sent home with her first ever homework packet. She couldn't get it out of her backpack fast enough to get started on it. The following day she walked in the door and asked to do her homework. It's the sweetest thing ever. I know with time this wears off and the shiny idea of homework wears away. For now we embrace it. I still wish we could have had our last year together where she dabbled in school via half day. Though in the end I'm just overwhelmingly grateful that Shane was able to do the half day path. I wouldn't have wanted to see/live through him adapting to full day kindergarten. Little Sister was fully prepared and ready to jump into full day kindergarten. She was comfortable with the school from years of hanging out waiting to pick up Shane. She knew the front office ladies and they knew her. She adored Mr. Sando, the PE teacher. I think she talked about him equally as much as Shane did before she even started school this year. Oh, we've had our fair share of snow in the past few months here in the Pacific Northwest. In reality, we haven't had that much snow compared to other places, but for here, it's been a lot more then we've had in the past few years. Our first snow hit in January. The kids could WAIT to get outside and play in it. The kids had a great time playing with our neighbor, Lillie. The last time it snowed, Adalyn didn't like sledding at all! This go around she couldn't get enough. until her little hands could take the cold any more. Shane spent 2 full hours out in the snow. Not coming in once. He made this sweet little snowman all on his own. And then it snowed again! And another day of school was missed and more time spent in the snow. We took Old Lady Sadie out into the snow. She loves romping in the white stuff! And then it snowed again. And the kids didn't even ask to go outside. They just wanted to go to school. I finally kicked them out and they spent a little time out in it. It appears that by the time it snows 3 times here in 3 months snow isn't so exciting by the 3rd time it comes around! Pacific Northwest kids....they don't do snow repeatedly and the complain if the sun is to bright! Adalyn and I had a day of girl time. I threw out a few things that she might want to do and the aquarium was the winner. She hadn't been since she was a toddler so I knew she didn't have any memory of the place. It was a true Seattle dark, rainy and windy day. But we bundled up and set out to the big city and had some adventures along the way. We got there when it opened and it started out quiet for a bit, but quickly filled up. About 30 minutes into our visit, she asked me when we were leaving. Oh, Dear! Hard for the 6 year old to understand that the time it took to drive there, pay for parking and pay to get in, we would be staying for a lot longer then 30 minutes! She was pretty quiet our first go around. Not really into much. A smile here and there. Our 2nd time around, she warmed up and finally got into the whole thing. 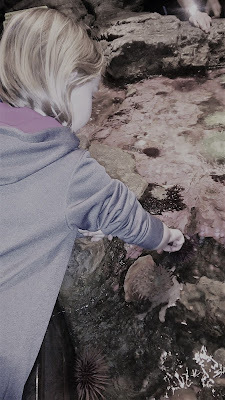 She refused to touch any of the animals in the tide pools for the first half. Finally, she allowed us to venture over and little by little she started to touch the sea creatures! In the end it was one of her favorite parts. 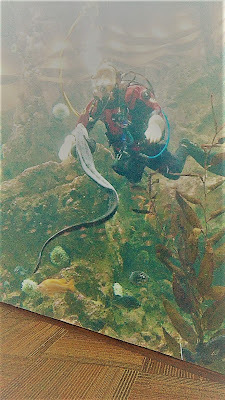 We got to watch two different diver shows in the main tank. I was surprised by how happy Adalyn was to sit and chill. She asked quite a few questions about the divers. 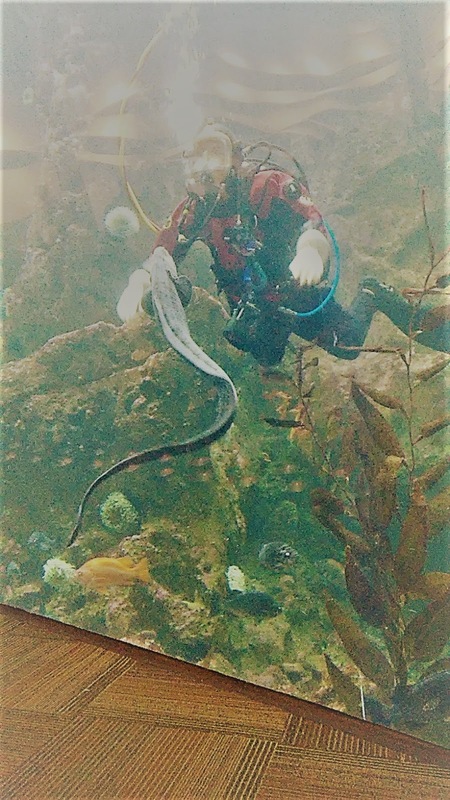 Both shows this friendly Wolf Eel came up to a diver to get hand feed. They mentioned that it was a rare treat and we got to see it twice! After killing two full hours at the Aquarium, we had some time left on our parking meter. I thought a stroll (in the pouring down freezing cold rain) over to Pike Place Market would be fun. I feel bad that our kids don't spend a lot of time steeped in the culture of the city of Seattle. I knew Adalyn didn't have any memories of Pike Place. Yay, it wasn't really a hit. Too crowded and the girl wanted out. 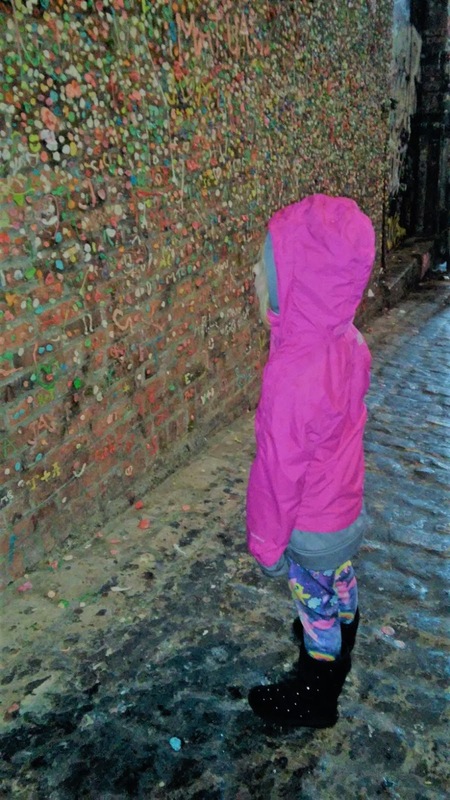 I did get her to swing by the Wall of Gum and she found that VERY interesting!! 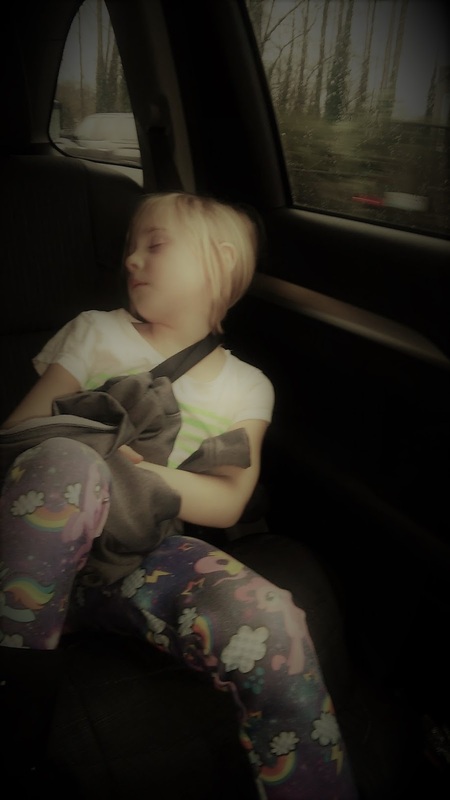 After struggling to get out of downtown Seattle, about half way home, Chatty asked if she could sleep. A few memories for the memory book.